Here is a clean and simple card that is inspired by Halloween. 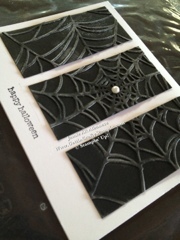 Here with our Spider Web Folder, Big Shot, Illuminate stamp pad, Teeny Tiny Wishes stamp set and Whisper White and Black papers (oh and a paper cutter) this easy card has a big impact! Running a 3 1/4" x 4 1/2" black cardstock through the Web folder and Big Shot you have a plain card. Running the surface of the raised part with the Illuminate stamp pad from our Holiday Mini it now is a shimmery dramatic look. It highlights the raise portion and is subtle enough to not be in your face. Cutting it every 1 1/2" you have equal portions if the web. 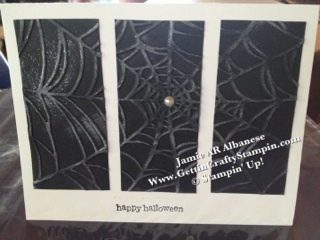 Using the Stazon Black ink to stamp the Happy Halloween from the Teeny Tiny Wishes stamp set at the bottom center allows me to build up the web w/out fighting the black cardstock. 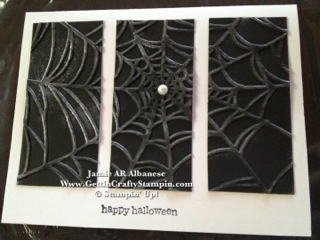 Layout the now 1 1/2" slices of shimmery web and then use SNAIL adhesive to adhere it down on the Whisper White card. Pulling up the larger pearl from the Jewels Basic Adhesive Backed Pearls it brings a little elegance and glamour to this simple but fun card!! With a few quick steps, few supplies a clean card is easy to make! 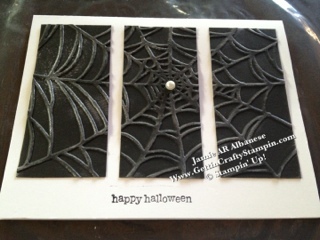 I know even my mom, who distastes spiders, would like this card! Thanks to the LNS for the clean card and white space challenge. This is a fun literal look for this weeks challenge. I love the simplicity of this card! Great job.